In part 1 of my reply to Willingham’s article on reading comprehension strategies published recently in the Washington Post, I took issue with his reasoning and analogies. In Part 2 of my response to Willingham, let me get right to the evidence. I propose that he has quoted very selectively and drawn questionable conclusions from the research he does cite. In his Washington Post article, he doesn’t cite research specifically; rather, he refers us to a paper he co-authored with Lovette, published in the Teachers College Record. Oddly, that article is almost identical to the Post article. The only difference is that he provides a paragraph of citations to support the claims he wishes to make on duration of intervention related to the strategies. And he changes the baseball analogy to golf. Gail Lovette and I (2014) found three quantitative reviews of RCS instruction in typically developing children and five reviews of studies of at-risk children or those with reading disabilities. All eight reviews reported that RCS instruction boosted reading comprehension, but NONE reported that practice of such instruction yielded further benefit. RCS instruction has a serious limitation. Its success is not due to the slow‐but‐steady improvement of comprehension skills, but rather to the learning of a bag of tricks. The strategies are helpful but they are quickly learned and don’t require a lot of practice. And there is actually plenty of data showing that extended practice of RCS instruction yields no benefit compared to briefer review. We know of eight quantitative reviews of RCS instruction, some summarizing studies of typically developing children (Fukkink & de Glopper, 1998; Rosenshine, Meister, & Chapman, 1996; Rosenshine & Meister, 1994) and some summarizing studies of at‐risk children or those identified with a learning disability (Berkeley, Scruggs, & Mastropieri, 2009; Elbaum, Vaughn, Tejero Hughes, & Watson Moody, 2000; Gajria, Jitendra, Sood, & Sacks, 2007; Suggate, 2010; Talbott, Lloyd, & Tankersley, 1994); none of these reviews show that more practice with a strategy provides an advantage. Ten sessions yield the same benefit as fifty sessions. The implication seems obvious; RCS instruction should be explicit and brief. Thus, in his Washington Post article he actually overstates what he and Lovette claimed in the original article. There is no justification for his claim in the Post article that “All eight reviews reported that RCS instruction boosted reading comprehension, but NONE reported that practice of such instruction yielded further benefit.” In fact, even the original claim is over-stated, as we shall see. Length of training. The median length of training for studies that used each type of procedural prompt is shown in Table 4. We uncovered no relationship between length of training and significance of results. The training period ranged from 4 to 25 sessions for studies with significant results, and from 8 to 50 sessions for studies with nonsignificant results. Unfortunately, the limited database does not allow us to infer the capacity of strategy use to achieve maintenance or transfer. Also, more research is needed to draw conclusions about the duration and length of treatments needed to positively affect maintenance and transfer effects. Although the database is larger for treatment intensity than for maintenance and transfer effects, we cannot make persuasive conclusions about the potential relationship between these variables. One study that contrasted a standard Reading Recovery program with a modified Reading Recovery program (Iversen & Tunmer, 1993) reported that students in the modified program were discontinued after an average of 41.75 lessons, compared with 57.31 lessons for students in the standard program. The effect size for students in the modified program was comparable to that of students in the standard program, suggesting that it is possible to achieve the same outcomes in a much shorter period of time by modifying the content of instruction. This finding suggests that efficiency, or the amount of progress over time, may be a useful variable to consider in conducting future studies. More disconcertingly, not once in either article does Willingham discuss the results of the six most well-known and well-studied interventions using multiple strategies: PALS, POSSE, CSR, TSI, CORI – all of which show significant gains through a significant investment in time, and many of which are highlighted in the various meta-analyses. In the study, 20 teachers implemented PALS for 15 weeks, and another 20 teachers did not. Students in the PALS classrooms demonstrated greater reading progress on all three measures of reading achievement used: words read correctly during a read-aloud, comprehension questions answered correctly, and missing words identified correctly in a cloze (maze) test. The program was effective not only for students with learning disabilities but also for students without disabilities, including low and average achievers. In light of this set of quotes, does the following Willingham conclusion seem warranted to you? In contrast, reading comprehension, writing, and study skills are examples of less-structured tasks. Such a task cannot be broken down into a fixed sequence of subtasks or steps that consistently and unfailingly lead to the desired end result. Unlike well-structured tasks, less-structured tasks are not characterized by fixed sequences of subtasks, and one cannot develop algorithms that students can use to complete these tasks. Because less-structured tasks are generally more difficult, they have also been called higher-level tasks. However, it is possible to make these tasks more manageable by providing students with cognitive strategies and procedures. A cognitive strategy is a heuristic. That is, a cognitive strategy is not a direct procedure or an algorithm to be followed precisely but rather a guide that serves to support learners as they develop internal procedures that enable them to perform higher-level operations. Generating questions about material that is read is an example of a cognitive strategy. Generating questions does not lead directly, in a step-by-step manner, to comprehension. Rather, in the process of generating questions, students need to search the text and combine information, and these processes help students comprehend what they read. Such heuristic thinking is essential to transfer; it’s hardly a trick, as we know from all the research on how general ideas and schemas bridge seemingly unique experiences (cf. Chapter 3 in How People Learn). Yet, Willingham does not mention transfer once, though it is indeed worried about in almost every study he cites. Why worry? Because results on the experimental post-test, designed by the researchers to assess their intervention on specific strategies, are typically much higher than results on a standardized test of reading comprehension later, where no prompts or reminders about the particular intervention studied are provided – i.e. transfer. Unfortunately, the limited database does not allow us to infer the capacity of strategy use to achieve maintenance or transfer. Also, more research is needed to draw conclusions about the duration and length of treatments needed to positively affect maintenance and transfer effects (Gersten et al., 2001). Although the database is larger for treatment intensity than for maintenance and transfer effects, we cannot make persuasive conclusions about the potential relationship between these variables. Furthermore, few studies helped children develop a deep understanding of complex text by effectively processing structural elements of expository text (e.g., Bakken et al., 1997; Smith & Friend, 1986) or stressed the social aspect of collaborative learning (e.g., Englert & Mariage, 1991; Klingner et al., 2004; Lederer, 2000) that Gersten et al. (2001) noted is critical to mediate learning and transfer effects. Improving performance is possible. However there is less evidence that comprehension focused interventions produce either autonomous use of comprehension strategies or longer-term improvements in comprehension proficiencies. The lack of evidence stems from the heavy reliance on smaller sample sizes and shorter-term intervention designs as well as limited attention to a gold standard of transfer of training to autonomous use. Arguably, transfer can only be caused by many interventions, a gradual release model, and lots of practice of multiple strategies simultaneously over a long period of time – as the research repeatedly says and as common sense tell us. Indeed, to close with one more sports analogy, the drills do not transfer easily to the game. It basically takes a full season of scrimmages, de-briefings, and lots of practice trying to apply the drills to game situations to make that transfer happen. Nor are the drills “tricks” even though they ultimately fade away in fluent automatic performance. And that’s arguably a more apt analogy for reading the research than Willingham’s discussion of sport and furniture-building. PS: I neglected in the first post to copy and paste my comments on one of the other research studies that Willingham cites: Sheri Berkeley, Thomas E. Scruggs and Margo A. Mastropieri (2010). For criterion referenced measures, mean weighted treatment effect sizes were highest for treatments of medium duration (more than 1 week but less than 1 month). Differences among treatments of varying length were statistically different according to a homogeneity test, Q(2, N = 30) = 6.68, p = .04. 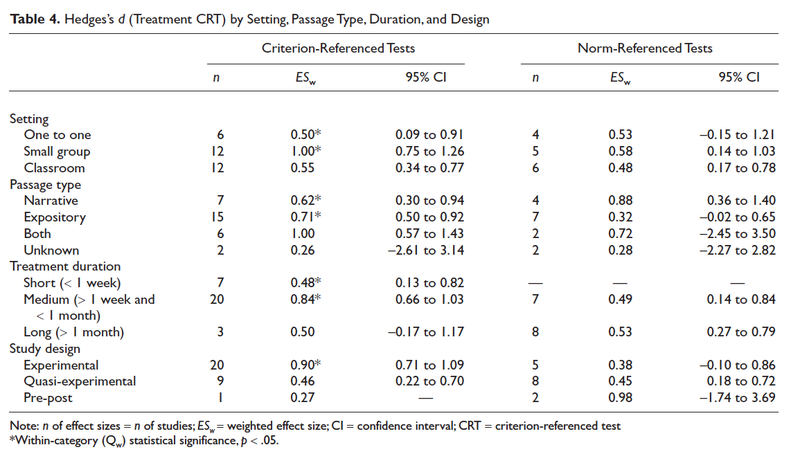 However, differences on norm-referenced tests by study duration were not statistically significant (p = .83). That treatments of moderate length were associated with higher effect sizes than either shorter or longer treatments is not easily explained. Note that only three studies were examined that took place over more than 1 month, due to the parameters of their study (a focus on remedial education for special needs students.) As we have seen many such studies exist for regular students, with strong effect sizes. Nor do this data quite support Willingham’s conclusion about the value of practice.